Daisy was afraid of just about everything- talking to people, raising her hand, even finding her classroom. She got a lot of help from kind people in her life, but on one particular day she had only herself to rely on. It was scary… but Daisy Did It Anyway. 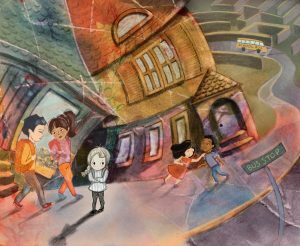 In the spirit of After the Fall by Dan Santat and If I Never Forever Endeavor by Holly Meade, Daisy Did It Anyway is a picture book for ages 4-8 that addresses personal growth and overcoming fear. The illustrations show the crazy and confusing way the world appears to our protagonist. Daisy will be a champion for any child with sensory issues, extreme shyness or on the autism spectrum. She will also help explain that world and make it accessible to anyone else. I am passionate about this subject because I was a highly sensitive child and and I understand how difficult this can be. I hold a BA in Fine Art and am a member of the Rocky Mountain chapter of SCBWI. Daisy is afraid to talk to new people, but Mama makes friends easily. Daisy is afraid to give kisses, but Daddy gives her bristly kisses. Daisy is afraid of the big kids, but Brother and Neighbor Jenny stand up for her. I’d like to see this! Please send a query, a link to your portfolio and the full manuscript to chquery@mcintoshandotis.com! Put PB Party Request in the subject line. The information in this website is provided "AS IS" with no warranties, and confers no rights. Feel free to disagree with me in the comments section of each entry, but I reserve the right to delete any comment for any reason whatsoever (abusive, profane, rude, or off topic). Keep it polite, please. This contest entry was posted on Tuesday, 3 April 2018.